The world-wide usage of drums dates back to 4,000 B.C. You are sitting in a room surrounded by people of all ages, races, and cultures. The smell of sage is in the air. A white candle flickers nearby. You don’t know these people, and if you were to converse you might find your lives have very little in common. But in this moment, you are not speaking. You are each beating a native drum from somewhere in the world: The Americas, Egypt, Africa, Japan or India. You share a rhythm, one that you are creating together. The beat creates an energy that flows through the group, connecting everyone. Welcome to a drumming circle. For centuries, people participated in these circles for community, spirituality, or healing. 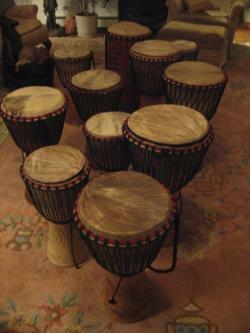 Drums date back to 4,000 B.C., with links to cultures around the world. Scientists discovered Chinese statues from 400 B.C., and Mexican pottery from 200 B.C., depicting groups of people using drums – perhaps some of the first signs of ancient drum circles. Why drums? All humans have rhythm. Our heartbeat, breathing and walking are rhythmic. A drumbeat is something we can all feel and create, regardless of our age, race, whether we are deaf or blind, or what language we speak. Rhythm can move us, stir us to action or dance, and calm us. Rhythm is a universal connection that creates a beat on anything we play it on. 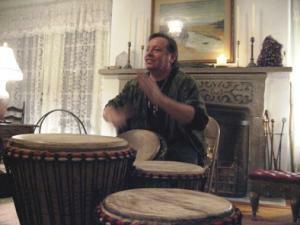 August John Cardinale is a drum leader who facilitates drumming circles in New York. The leader guides the group, depending on the circle’s purpose, and leads participants through various beats. “A typical community drum circle might run for an hour and a half to two hours,” Cardinale explains. All ages are welcomed, and he notes that children tend to become more animated and focused when they play the drums. “The vibrations and the rhythms grab their attention and actually draw them into the experience,” he says. Over the course of the world’s cultural history, the use of drums covered a wide range of rituals and ceremonies of medicine, to warn of danger, summon rainfall, drive away evil, and bring good spirits. Just as in ancient times, drumming circles are used today to connect to the healing rhythm of Mother Earth. They are intended to transform negative energies into positive vibrations and let people connect to each other and celebrate life. “When I lead a drumming circle, I talk about connecting to Spirit, the Creator or the All,” says Cardinale. “I also talk about drumming with intention, and connecting with the collective consciousness, and the energy and rhythm of the Earth. It helps the participants to become more than their individual selves, and reminds us that we are each part of a greater whole. Like Cardinale’s group, most drumming circles welcome anyone from beginners through experts, unless the circle has a particular purpose. “You can drum with a specific intention to heal yourself, others on the planet, or you can drum just for fun,” he says. “Either way, drumming is energy work. It raises your vibration so you can connect with Spirit.” A facilitator usually begins by playing a basic rhythm and then people can join in and improvise on this initial beat. “In our drumming circles, the first half hour or so of drumming is used to get rid of negative energy or stress.” he explains. “The intention is to transform what they don’t need into what they want. The next half hour is used to unify the group in vibration and energy, to take in what they or others need or want for themselves." The last half hour is to ground or ‘root’ participants to Mother Earth [which] is for the highest good of all.” It also helps finish the evening on a positive note. Meditations can also help set the tone and intention of a drumming circle, as can deep breathing exercises and visualization. The focus of participants enhances the energy of the group and helps individuals connect to each other and whatever purpose they bring into the circle. All anyone needs to participate in a drumming circle is their own humanity. Cultural backgrounds, race, musical ability, and geographic location are irrelevant. Circles can be found everywhere from Maine to California, and around the world. As more and more people tap into this unifying practice, collectively, we are bringing the world together – one drumbeat at a time.